A brand new NRL Season dawns on March 1 in Newcastle and unless you've been endlessly entertained by watching Darren Lockyer's hilarious (but somehow right) missed conversion in his last play in Rugby League on an endless loop on YouTube - you are bursting for some Rugby League right about now. So here's some Rugby League to get you through the end of January and ready for the trials that are just around the corner. In 2012, the author will be posting content for some more official sites as well as on http://www.wdnicolson.com but as an Australia Day treat you get a quick look at our 2012 NRL Forecasts for all 16 Teams. NOT The Footy Show may also be back for one episode cameo with a Live Season Preview of our own in early February. 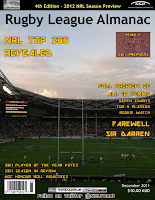 If you want the whole preview you'll need to pick yourself up a copy of the 2012 Rugby League Almanac for just $10.00 - where every team is analysed in depth and our Predicted Ladder and Premiership pick is published. 2012 FORECAST… and boldly premature prediction. How big a loss is Darren Lockyer? The difference between playing Finals Football and golfing in September. Just. A number of teams will need to fall over in order to give the Raiders a chance at returning to the playoffs. They should stay in the race all season long but the extent of their success looks limited by their halves. As good as Paul Gallen may be, it is the acquisition of Todd Carney that makes Cronulla a playoff contender. The roster overhaul came a year too late but the new faces give Cartwright’s team every chance to improve in 2012. Hasler aside, almost all the Premiership winning pieces are in place for another assault on September. How far can 3 Superstars get you in the NRL today? Back into the Top 4 and a shot at glory if you’re Melbourne. Tinklertown (or is it Waynecastle?) is buzzing with anticipation for 2012, and it should be – look contenders. If they can move on from their playoff nightmare, the Cowboys can contend thanks to Thurston and Bowen. Can they be a playoff team a year after just avoiding the spoon? In the NRL these days that’s not uncommon. Could be good, could be awful. This Penrith roster has some talent but probably not enough to reach September. Will Star laden roster be burdened by a rookie half and inconsistent five-eighth? But if halves click = Hello Finals. Their reign at the top is over and their rookie coach has it all to do. Could grab a low playoff seed however. Have engaged the youth movement. A playoff spot looks tough to attain but this is the right course of action. A lot of things went right for them in their playoff run last year, should expect a rockier road trying to emulate it. This may be the year the premiership window closes on the Tigers, or they might jump through it for title two. What does your Top 8 look like before the NRL Pre-Season begins? And how influenced will your ladder be by any trial form? Also - watch out for the First of our Dream Team Guides on Official NRL Club Sites next week. 2012 Rugby League Almanac Available Now. While you're here on the site - please consider grabbing a copy of the 2012 Rugby League Almanac - a 49 page season guide for just $10.00 that will give you the most in depth analysis of the 2012 NRL Season on the market. This is just pure Rugby League - you won't be disappointed. Read more below for what else is inside the downloadable document.